Visitors to the Natchitoches Historic District during December will see an increase in pedestrian traffic along Front and Second Street. 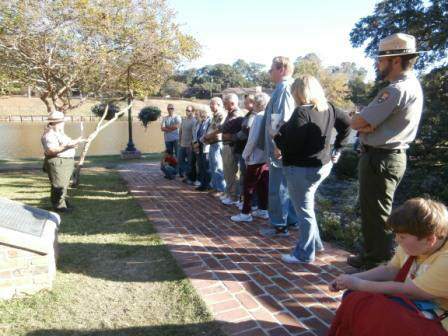 Cane River Creole National Historical Park is partnering with the Historic Downtown Development Commission to present walking tours of one of the Nation’s most historic and picturesque downtown landscapes. 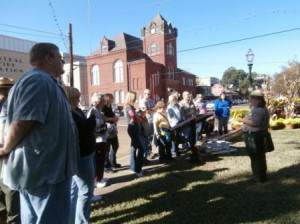 The tours will provide visitors with and overview of Natchitoches history led by a National Park Ranger. They will discuss the areas native tribes and conclude with describing 21st century preservation efforts. Along the way visitors will hear about the Colonial period, Civil War and contributions of the Creole culture. 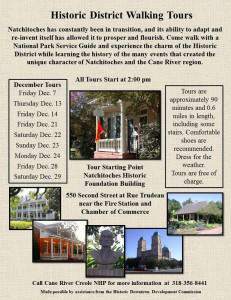 Each tour will begin at 2:00 pm at the Cunningham Law Office (Headquarters of the Natchitoches Historic Foundation), located at 550 Second Street. The tours will last approximately 90 minutes and will require a moderate amount of walking. There is no charge to take the tour. For additional information contact the NPS at 318-356-8441.
and Keep the Christmas Spirit All Year! Rain or shine the Natchitoches Christmas Festival will go on!